In Japan, there is a holiday week called “Golden Week” over the first week of May from the end of April. This holiday week has 4 national holidays in the week. It is the season when the spring ends and early summer comes. The weather of this time of the year is relatively stable and it is a very good time for sightseeing and outdoor leisure activities. 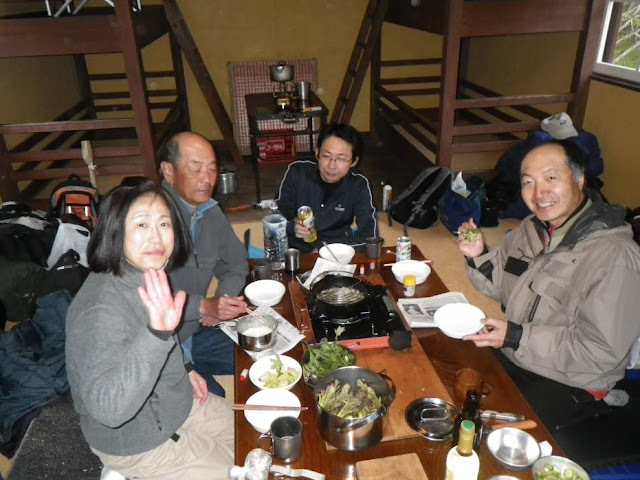 It is very common for people in Japan to enjoy returning to see the family living in the countryside or go on a trip, but for us, keiryu fishers, this season may have another meaning. 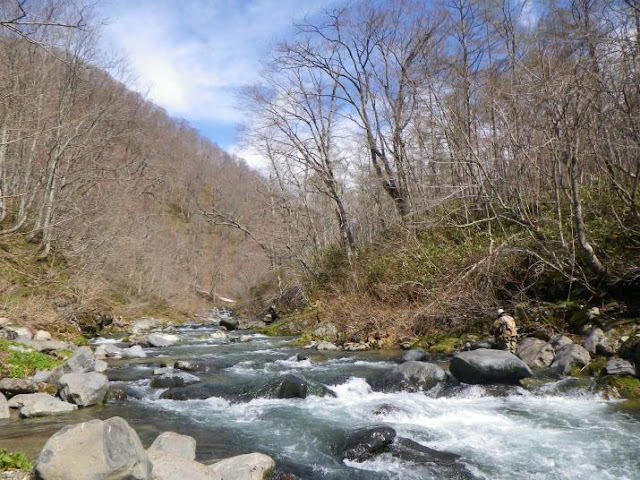 Mountain cherry blossoms scattered and wild wisteria start blooming lily flowers in the valley, we are in the mood of moving our fishing field to the headwaters from the mountain village streams. 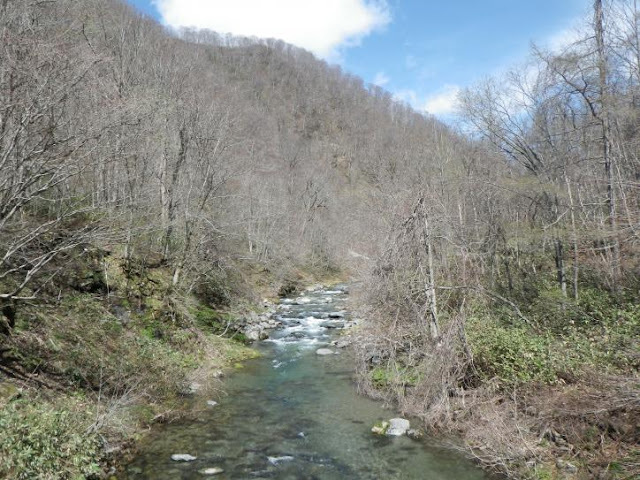 Mountain streams in the high mountains still refuse fishers with impact of run-off. However, we start to go into the headwaters of the low mountain range of less snow region. 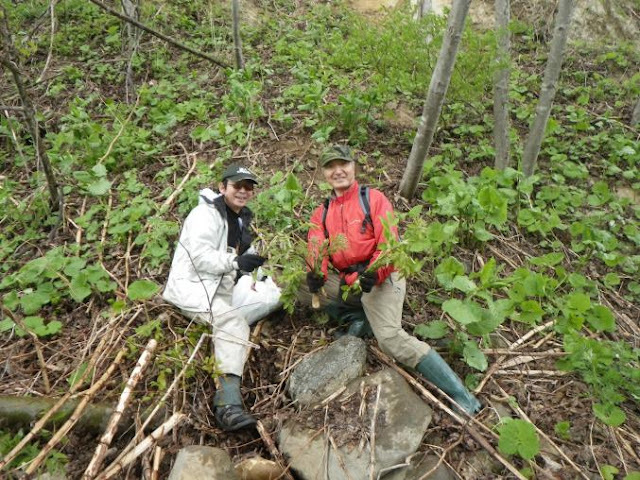 Every year at Golden-week we go to Minami-Zaou at south of Tohoku for iwana fishing and also sansei (Mountain plants) picking. Minami-Zaou is the south part of Zaou National Park, spread in two prefectures of Miyagi and Yamagata. There are beautiful mountains of 1500 to 1800m. I went there with 4 friends this year too. It is about 3 hours by car taking motorway from my home town to Minami-Zaou. I picked up one friend near my home and drove to the north. We arrived at one big branch stream of Shiroishi river around 7:00 am. Already two friends had arrived at the meeting point of the camping ground. We were pleased after a long time of reunion, but I soon felt the temperature was unexpectedly low, and the stream was bit swollen by the rain of the day before. We had very good weather and high temperature until 2 day before. So I thought this swoop of the temperature was not good for fishing. Actually we had much less snow in the last winter, and we checked that the forest road was cleaned and maintained almost of the sections much earlier than usual years and the stream had already no influence of run-off. I really felt nature does not go as we want. At 8:00 am after having quick breakfast, we drove the car on the forest road to up-stream and parked the car at the best section of the stream. The stream was quit big and we separated in 2 groups and started fishing. The water was quite high and main current was very fast, but it looked OK if we drift flies onto the gentle current part. In about 30 minutes we waded and fished about 150m but no one had bite at all. We knew there were bunch of iwana in this stream. If the condition is very good, we could fish iwana nearly every good point. Probably the sharp descent of the temperature downed their feeding activity. I wished the sun would come out and hatch of flies start, but there were only strong winds blowing off the thick clouds. What’s more, a couple of hours later it started raining with hails. We quitted fishing and got on the car. We drove the car about 8km to the down-stream and arrived at the meeting point of camping ground, by the time the rain was stopped and sun appeared, and another friend was just preparing for sansai picking. We talked about fishing situation and gave up more fishing on that day. Time was just noon. We had lunch at the camping ground. After lunch when we were having rest, it started rain again. We first planed camping there, but facing that terrible weather situation we decided to rent a bungalow at the pay camp site near there. After checking in at camp site, we changed our cloths for sansai picking. We first went to the southern slope of the mountain at the felling trace of cedar trees. This kind of sunny field is good place for Taranome(Fatsia sprouts). Taranome has good volume and texture and it is called “King of Sansai”. We cook them in some ways but tempura is probably the best way to taste them. Timing of harvest was just right and there were no other people before us. We had enough Taranome there. At this same field we also found Aiko. Aiko is young bud of Miyama-Irakusa (Nettle species). 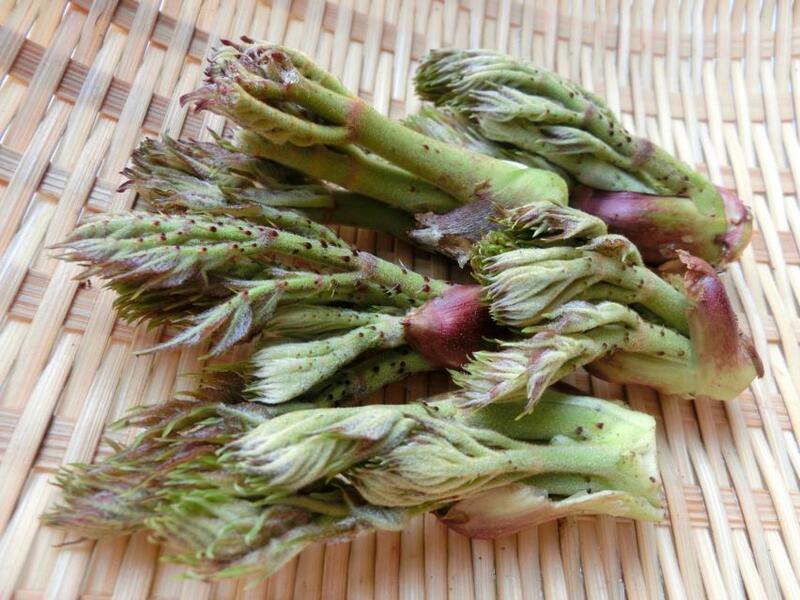 It is low shrub with thorns but very good for boiled or tempura. Next, we moved to the place and picked some good Udo (Young bud of Japanese Spikenard). We eat the leaves with tempura, and use thick portion of the stems for various cooking or eat boiled or row with vinegar-miso. We found some nice Kogomi(Young bud of Ostrich fern) in the same place. Kogomi is also good with tempura or boiled. We had enough sansai including some for souvenirs in about 2 or 3 hours. So we went back to the bungalow and started preparation of cuisines. Sometimes we had the sun coming out from the thick clouds, but as ever the wind is strong, and it rained sometimes. In the early evening, we started sansai party in the bungalow. We had cheers with beer and first enjoyed tempura. Freshly fried tempura of Taranome, Kogomi and Aiko were so good. Season's first wild sansai with tenpura was just bliss of taste. Although we can buy cultivated sansai in town, real sansai that was picked in the mountains was totally different in aroma and taste. Main course that night was sansai spaghetti. Combine lightly boiled sansai and consomme-based soup, and put the al dente cooked spaghetti in it. We enjoyed fresh scent, firm texture and a gem taste of sansai with this once a year menu. We were having fun time with more drink and appetizers until late at night. Next morning it was lovely weather when we woke up, but there are snows on the top of the mountains. Yes, temperature of that morning was also very cold again. So we had breakfast slowly until the sun goes high up in the sky. We cleaned the bungalow and changed for fishing. We were wondering about reaction of iwana that day and drove the car to the forest road. Trees along the dirt road were finally dressed in the green shoots, and mountain stream that glimpses to the other side had water of really good color. We were driving the car along the river towered the up-stream with full of expectations in our chests.